Our Outreach Ministry is designed to use various outreach methods to involve as many people as possible in reaching and witnessing actions. Instead of limiting outreach only to those members who will visit lost people or prospects door-to-door, we have broadened our horizons of outreach. 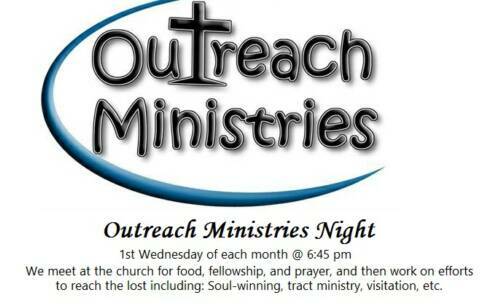 We have our Outreach Night on the first Wednesday night of each month. This special monthly meeting is designed to help enlist as many members as possible in reaching the lost.